Jeans have pretty much become my second skin this winter, but it at least felt good to take a break from my usual silhouette and wear a blouse and blazer instead of a sweater and a button down. I can't wait for this one last snowstorm (I hope) to pass, for the temperature to break 40°, and for spring fashion to become my reality. The furry bag is another one of my February purchases, Roundabout, the high-end consignment store in Westport, CT was having a major winter clearance sale with items at 75% off. The bag is label-less, but the fur feels real and it definitely looks vintage, the consignment price was $95, so it was $24. It's been quite the conversation piece everywhere I've taken it, with people asking me about 'my little creature'. I finally got out of my jeans the other day and it felt so good! I love this dressy look on you pretty lady! I love the textures of the fur bag and lace blouse. You look chic! We're supposed to get up to 50 next week. I can't even believe the end is near. Jeans have been my uniform for what feels like months! With the crazy weather they have been the most comfortable. Love that fur bag also, so unique! Ack, you look so sophisticated. That purse is everything! This had better be the last snowstorm!! I love the neckline of your top, and the bag is too cute! Haha..."little creature"... I think that purse is awesome! The fur looks really nice. Gorgeous earrings too! That purse makes such a great statement and really sets off your whole look! I love those earrings! And this blouse is so pretty. I can definitely see how it could be a fun conversation piece! I love it with this sleek look! Ohh this is one of my favorite looks of yours. 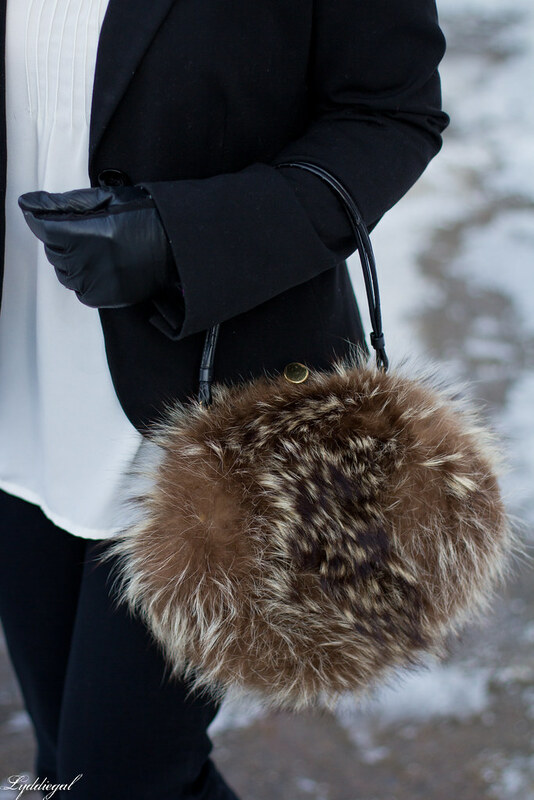 I love the black and white and the fur bag is just so fun. I have been in jeans a ton this winter lately and cannot seem to stop wearing black and white. So good! Who does'nt love a good pair of jeans and you wear them so very well. It is never that cold here and I still wear jeans almost everyday. I also love that fur ball bag you are wearing, it's so kuute! So pretty! Loving the lace with the blazer! So chic and I cant get over that bag! Designer or not, that bag is fabulous! And you got it for such a great price! I hope it warms up for you! Not to rub it in but it's 68 degrees here today :) And I'm layered in a light cardi, denim jacket, and scarf because I consider 68 chilly. lol. Beautiful blouse! Love the classic, clean look! that bag! omg I loooove it and you look so happy in these pics. What an amazing bag! I would just want to pet it all day! I love the pretty neck detail on that blouse! I love this mix of textures--the denim, the soft lacy blouse, the furry bag. It all comes together for a pretty, feminine look! Such a great look! And I love your "furry creature"! That purse really dresses up the outfit. It is such a fun bag! I think things that make us fall into a wardrobe rut (like cold weather) can be good in a way, as we start trying to change up things a little (like trying a blouse and blazer instead of a knit). It's good to try something a little different, gives you more options for next winter! :) I'd never knows I could wear maxi skirts so much until I needed the elastic waists during pregnancy, now I'm full of ideas for how to wear them, haha! Hope the warm weather comes to you soon. Swoon, I love your blouse and the whole outfit looks great. Have a lovely weekend, dear. I love that top and the bag is so much fun! Its difficult to try and stay away from jeans, they are so easy ! I like your new little bag I can imagine Chloe sniffing it.